BY ION CARAMITRU Hosted by Dr Mike Phillips OBE, British novelist, historian and curator Followed by a Q&A session Thursday 19 May 2011, 19.00-21.00, The Ratiu Foundation / Romanian Cultural Centre Manchester Square, 18 Fitzhardinge Street, London W1H 6EQ; Tel. 020 7486 0295, ext 108; e-mail: bookings@romanianculturalcentre.org.uk; Entry is free but booking is essential. Limited seating, on a first-come, first-served basis � book early to avoid disappointment. �In February 1992, I was invited to London by Mark Fisher, Shadow Minister for the Arts on behalf of the Labour Party, to hold a conference in the British Parliament, together with Umberto Eco and Gunter Grass. It was an event organised in collaboration with the Paul Hamlyn Foundation. I wrote and spoke about Romania and its recent history, and about myself. Speaking recently within the conferences organised by the National Theatre in Bucharest, I entitled my talk �Limitele asteptarii� (When Do We Want It? Now!) and I realised that what I was saying in 1992 had unfortunately remained still very relevant.� � Ion Caramitru. �In the part of the world that I come from, a generation was born and lived which, besieged in its own country, understood that culture was the only way out. To overcome a deep sense of metaphysical fear, this generation formed deep and trusting friendships, searched for books, went to the theatre and made great efforts to learn foreign languages [...] Looking back on it now, why does it remind me of Gogol, of Dostoyevsky, of Swift? Why, at a time of lies and compromise, did I feel the need to withdraw into the theatre? Was it because everything seems possible there? [...] I recall that several years ago in an interview, I answered the question: �What does the theatre mean to you?� with the words: �A chance to survive.�� � excerpt from the 1992 conference held in London, in the House of Commons. Ion Caramitru OBE, actor extraordinaire, General Director of the National Theatre in Bucharest (starting in June 2005), president of the Romanian Theatre Union � UNITER, former Vice-President of post-revolutionary Romania (1990), director of the Bulandra Theatre of Bucharest (1990-1993), and Minister of Culture (1996-2000). 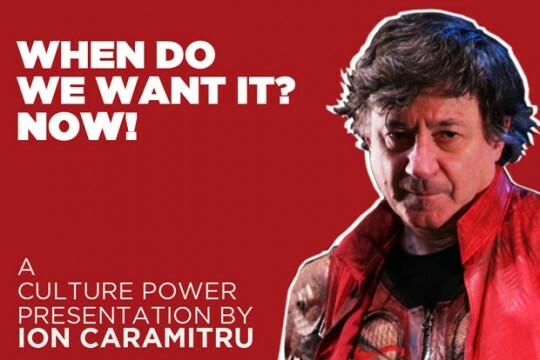 A stage and screen actor and a respected theatre director, Ion Caramitru has played an array of roles ranging from �Hamlet� and �Edward III� in the theatre to main and supporting roles in Romanian, British and Hollywood films. The Bulandra Theatre�s production of �Hamlet� directed by Alexandru Tocilescu, which visited the National Theatre London in 1990, was warmly received both by the audience and the critics. Ion Caramitru is also a professor at the National University of Theatre and Film of Bucharest, and was instrumental in creating and putting into practice social and cultural programmes such as The Artists� House, the �Artists for Artists� annual charity shows, Cliniclown, Artschool, etc. A militant for democracy and active revolutionary during the 1989 Romanian revolution, Ion Caramitru is also a major figure of the Romanian civil society movement. // // // // // // // // // // // // Dr Mike Phillips OBE is a novelist, historian and curator, consultant to various cultural organisations across Europe. Organised by The Ratiu Foundation / Romanian Cultural Centre in London. Culture Power is a programme initiated by the Ratiu Foundation, consisting of a number of presentations and constructive dialogue with an invited audience. With the support of Profusion International Creative Consultancy. Note: Image above shows Ion Caramitru as �Edward III�. Photo � Courtesy of Ion Caramitru.